Hi there! It delights me to be over here taking part in Aimee's Summer Soirée. My name is Michele, and you can find me a'blogging and a'crafting over at Michele Made Me. My passion is garbage. 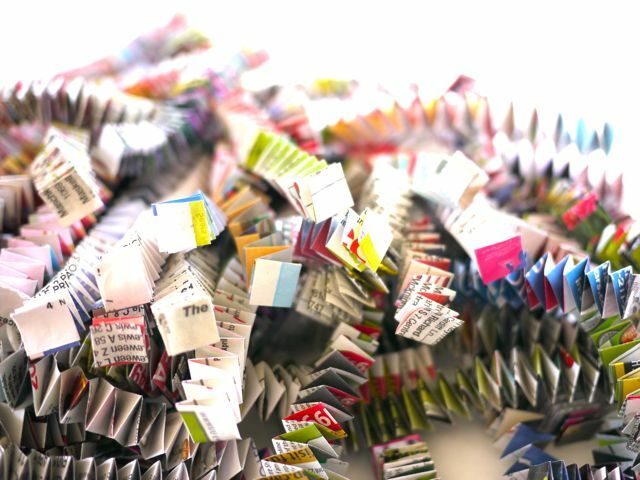 I like to get my hands dirty making pretty things out of egg cartons, foam trays, junk mail and all manner of refuse really. And when I'm not garbage-picking, I also enjoy sewing, quilting, and crocheting. 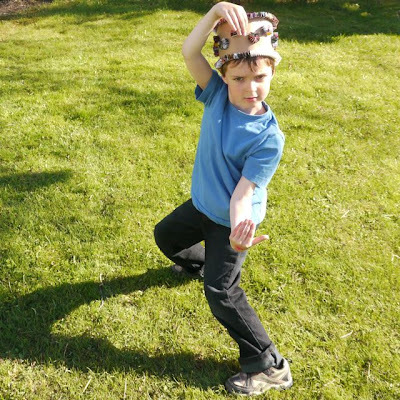 My little boy and I often make stuff together, so today we'll be sharing one of his favourite things: his box chain "king hat". Basically, our king hat is just box chains made from junk mail and old gift wrap attached to a band of craft paper. The chains do take some time to make so I like to divide this craft over two days so as not to bore my little guy. We make the chains one day, and put the whole thing together the next. You probably know how to make box chains already. If so, skip on over to step 11. For those of you who've not yet heard of these snazzy little box chains, let's go through steps 1 to 10 lickety-split. It's super-easy; your children will love making these versatile chains once they get the hang of them. 1. 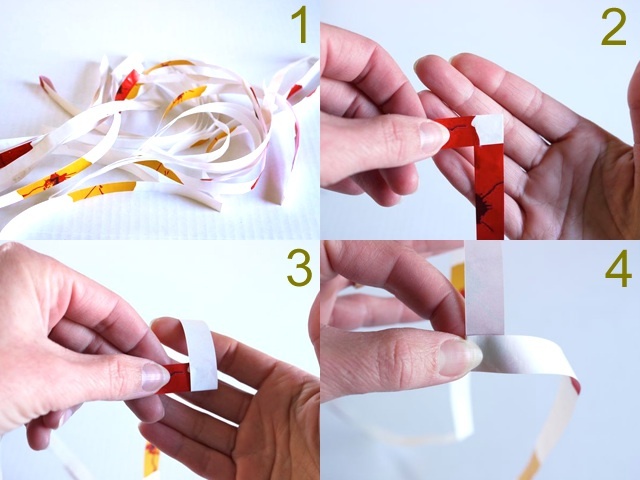 Cut your junk mail and/or old gift wrap into 1/2 inch (1.2 cm) strips. 2. 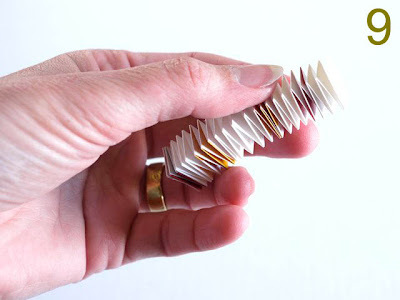 Take two strips and glue the ends together at 90° angles to one another. 3. Take the strip that is hanging vertically down and fold it up, keeping the 90° angle. 4. Now take the horizontal strip and fold it over to the right, maintaining that 90° angle. 5. Fold the vertical strip back down, yep, with the 90° angle. 6. Fold the horizontal strip back over to the left at a 90° angle. 7. Repeat steps 3 through 6 until you get to the end of your strips. 8. Glue the last little end down. 9. Here's what your finished box chain looks like. Happy box chain. We need some little box chain gems as well. It is a crown after all. 11. Take a short chain, some glue and a short strip of paper. 12. Slather glue on the short strip of paper. 13. 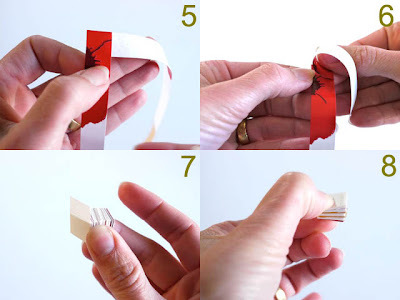 Glue one end of the chain to the strip of paper. 14. Glue the other end of the chain to the strip as well. Repeat many times. We made 12 gems in total. Pretty gems. 15. 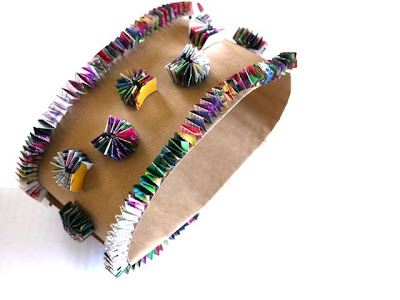 Cut out a piece of craft paper to fit around your child's head adding 3 inches (7.5 cm) for an overlap. We made ours 24 inches (60 cm) long by 9 inches (23 cm) wide. 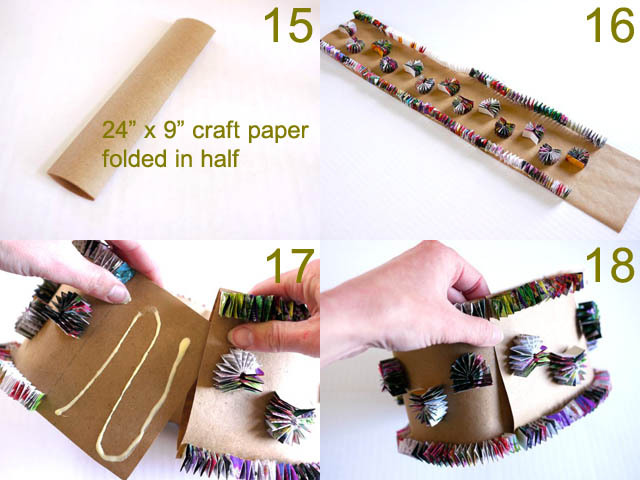 Fold the craft paper in half lengthwise. 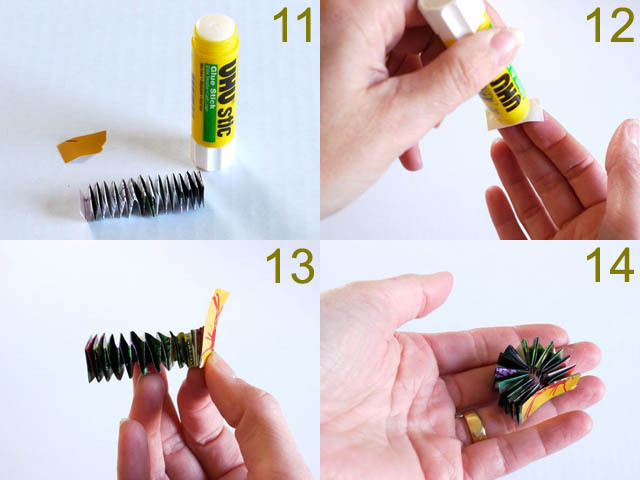 Apply glue between the layers leaving 3 inches (7.5 cm) at both ends free of glue. 16. 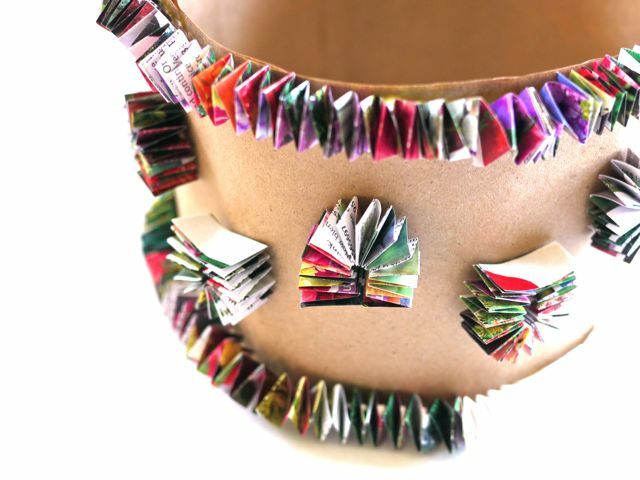 Apply a very generous bead of PVA glue to the edges of your craft paper. Do not apply glue to the overlap shown in Photo 16 (last 3 inches or 7.5 cm). Place your long box chain on the bead of glue, making sure that the chain comes in contact with the glue along the entire bead. No chains on the overlap. Glue on the gems as desired. Let the glue dry. 17. 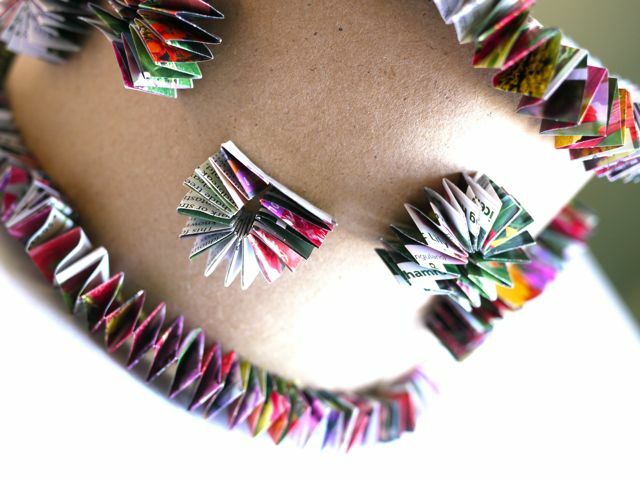 Complete the crown by applying glue to the back, front and between the layers of the overlap. Bring the overlap around and insert it between the layers of the other end. 18. Press the layers together to complete the crown. And look-ee, you are done! One king-hat for a very serious karate king! 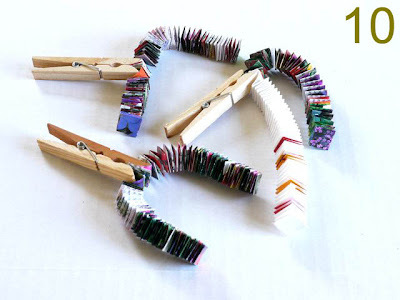 I have a few more box chain craft ideas right here by the way. Do drop by Michele Made Me anytime for a visit; I'd love to have you. And thank you so much for having me over Aimee. I've had a royal good time! I absolutely love the picture of him wearing the hat! It makes me smile every time I see it. Thanks Aimee! And thanks so much for the invite!